A posting today on an educational blog provides ‘19 Meaningful Questions You Should Ask Your Child's Teacher’. · How are creativity and innovative thinking used on a daily basis in your classroom? · How is critical thinking used on a daily basis in your classroom? · How are assessments designed to promote learning rather than simple measurement? · What are the most common instructional or literacy strategies you will use this year? Seriously. A dentist is a professional who undergoes training for about the same length of time as a teacher, and then gains a huge amount of experience on the job. Teachers and dentists both look after things that are precious to you. If you would ask your dentist questions about what dental strategies they favour, whether they are up to date with the latest great initiative in fillings, how they direct the assistant so that the support is targeted where it’s needed, what innovative approaches they use – then fine, ask your child’s teacher the equivalent questions. But if you trust your dentist’s expertise and reputation, then don’t waste your time or the dentist’s or the teacher's. Moreover, bear in mind the level of quality control that exists in schools. Your child’s teacher is subject to scrutiny from their line manager (in the UK, that is usually the Head) and the Head is under the oversight of inspectors from both the government and from the local authority or an academy chain. And unlike your dentist, results are published annually and communicated to you. It will be clear by now that I am urging parents to trust the teachers. If you do not trust your child’s teacher, then rather than undermining the professionalism of the teacher with such questions, you should be either going to the Head with your concerns, or finding a different school. Is there anything I can volunteer for that would help the school? Beyond that, don’t worry. Trust the professionalism of the teacher and the quality control systems in the school. 1. How will you respond if or when my child struggles in class? Just as in all schools, tasks and investigations are planned to meet the child at their level of challenge. A child who is not coping is given support or challenged at a revised level. If it was a real problem, I would have spoken to the special needs co-ordinator a long time ago and I would have consulted you. Don’t worry. 2. What are the most common instructional or literacy strategies you will use this year? I’m a teacher. I plan the content of lessons, but as for strategies they come up naturally. I have no idea which strategies I use more than others. It depends on the lesson. May I refer you to the published curriculum on the government/state/local authority website, which outlines what children need to know year on year? I’m a teacher, ok? So there is critical thinking in my classroom. Daily, you ask? Maybe one day last week I didn’t have any. But I assure you it happens. Where did you get these questions from? An educational blog? You’re kidding. But ok, here we go. It is wrong to assume that ‘simple measurement’ doesn’t promote learning. All assessment promotes learning because you are finding the gaps that need filling. Assessment that doesn’t promote learning is not assessment. That indeed is the essence of teaching – plan it, teach it, see if they’ve understood it, and then respond accordingly. Sigh... How about reading to your child and getting them to read to you? Just a thought. 9. What academic standards do you use, and what do I need to know about them? National Curriculum levels [or local equivalent]. As for what you need to know, if you are completely ignorant of the standards then it will make little difference to your child’s education. We will refer to the standards in your child’s report and provide definitions. If you do want to know more, Google it. 10. 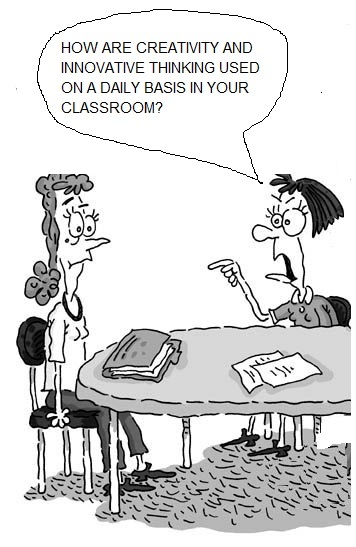 What kinds of questions do you suggest that I ask my children on a daily basis about your class? ‘Did you have a good day?’ That’s it. If they just say ‘yes’ and don’t want to say any more, then drop it. The school is their life, not yours. Let your kid have a break from your helicopter parenting. 11. How exactly is learning personalized in your classroom? In the school? Look on our website. There is probably some platitudinous policy there saying how every child is an individual and how we enrich them on that individual level. The truth? Your child is one of thirty children in my class and most of the time most of the pupils will learn in a group because that is the way the most learning is achieved with the limited time that I have available. 12. How do you measure academic progress? Like every school, formally with occasional tests and informally from observations. Mostly I just know where the children are because I am a competent and experienced teacher. If you are interviewing me for a job then by all means ask me questions like that but I have to say it’s a bit odd at a parents’ evening. To be honest I don’t think of ‘learning models’ from one year’s end to the other. I teach and the pupils learn. Don’t. Please, please don’t. Just listen to your child read and practise their times tables with them occasionally, but otherwise leave the curriculum to the school. I will teach them, and if they need help with homework they will ask you. 15. Is there technology you'd recommend that can help support my child in self-directed learning? Progress is fine though I could do with forty-eight hours in the day. I could talk to you until sunrise about this, or you could find your answer via Google. I’d prefer the latter. Teaching. Oh, sorry, you wanted something more cuddly.... Enabling. Facilitating. Whatevering. Great answers! I completely agree with you about the whole thing. There are much better questions parents can ask us like the ones you mentioned. Thank you for this response. The article made me almost hyperventilate. Obviously the author has not been a real life teacher. Oh, and notice that most of those who commented favorably were NOT teachers. Of course. Because everyone who is not a teacher knows what teachers should do. Wow. "Parents, dont worry, we got this." Um, no, I don't think so. As a parent I have full right to know everything you are teaching my child. Trust has zero to do with it. I can have polite conversations with my child's teacher and I can be informed about the way they are learning, the things they are being taught and how I can help them. This article is kind of why so many are turning to homeschooling. Seriously, if my child's teacher thinks like this I would move them immediately out. It might be your job to teach them a few hours a day but its been my job since they were born and long after they finish the one year that teacher has influence over them. Try working with the parent instead of being condescending.